In this Meet the Cyclists interview, I talk with Ernest Markwood who is currently cycling from Africa and Beyond. 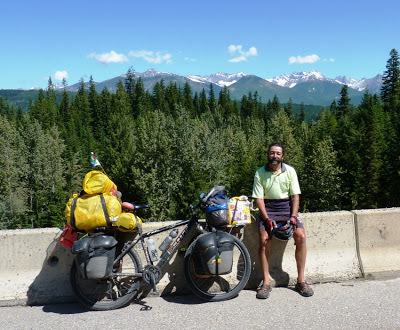 Find out about his bike touring adventures here! I like to keep my interest in travel alive and well by reading other peoples travel blogs. I read quite a few, and every now and again, I like to feature one in a section called Meet the Cyclists. Recently, I got in touch with Ernest Markwood who documents his travels on his blog http://ernestonbike.blogspot.co.uk/ and asked him a few questions. He started cycling in 2007 from South Africa, and has been on the road ever since, and as I write this, he is in Canada. I could go into greater detail about who Ernest is, and what his journey is about, but I really encourage you to visit his blog in order to find out for yourselves. I honestly believe that this guy deserves a far wider audience, and I hope you can be a part of that. Before you go and visit his travel blog though, have a look at the brief question and answer session below. Why did you take the decision to sell everything that you own, and begin cycling around the world? My partner, Leana Niemand (who I've known for most of my life), started this trip with me. A couple of years before we took off, Leana had cycled the Tour D'Afrique, and this proved to me that it was possible to cycle through Africa (which was my initial goal with this trip). I also found the idea of “leaving the Rat Race behind me” rather alluring. What made you choose cycling over backpacking or overlanding in a vehicle? A vehicle (or motorcycle) would have been beyond my finances. Even backpackers rely on costly transport, and they are limited to certain routes and roads. A bicycle gives me more freedom of movement, I can access isolated areas for wild camping, and the exercise keeps me healthy regardless of what I eat or drink. Also, cycling provides challenges, e.g. through Africa, or now, around the world). You started your trip in 2007 – How do you keep yourself going financially, mentally and physically? My original finances are long gone. Friends and family have occasionally donated some cash to keep me alive. A couple of years go when I was cycling through Australia, my mother died and left me a bit of money. When Leana was with me she carried most of the living expenses. Now I rely very much on my sister in South Africa, who is my main sponsor. I do presentations of my trip once in a while when I stay in a place long enough, and request donations. Have you ever seriously considered calling it a day, and either returning home or settling down somewhere? Not seriously. I have no home other than what is on my bike, and I haven't actually found a suitable place to settle. Anyway, even after staying in a place for a week or so (regardless of how nice it is, and how well I'm being treated by my hosts), I feel a compelling need to get moving again. It's been nearly six and a half years on the bike now, it will be very difficult if and when I have to stop. You have cycled through a LOT of countries! Which ones have been your favourites, and which ones would you never return to again even if someone paid you?! I cannot seriously think of any place to which I would not want to return (as it is, many of them are now nostalgic memories of years gone by). I guess my favourite countries have been those where it has been easiest to camp wherever I pleased, such as Turkey. I also liked SW China, most South American, and central American countries. I am now in Canada, where I find the people particularly generous and friendly. It seems like you have already cycled everywhere! Where do you think your route will take you over the next 12 months? The only continent across which I still have to cycle, is Europe. (I guess Antarctica is not really viable as a cycling venue). As an African it is a bit of a mission to get the visa for the EU when I am not in my home country, but I am giving it a try while I am in North America. (Don't worry, I will then pay a visit to the UK and Ireland as well). Even so, I would have to wait until next spring to visit Europe, so from the East coast of Canada I will head back South into the USA, then hopefully cross to West Africa, and go North from there. However, that is mostly speculation, as plans often have to be adapted according to circumstances. What tips could you offer other people thinking of cycling around the world? You should probably not even be thinking about “Cycling Around the World“, it's a big concept and you may just end up overwhelming yourself. Deal with a trip like this in the way you would eat an elephant – a mouthful at a time. For instance, if you tried to organise all your travel documents beforehand, then many of those would have expired by the time you get there. In any case, plans often have to be diverted due to practicalities such as war and so forth. Having said that, I would suggest that you start off in the direction of your dreams, then you can generally add on to that route a country/region at a time. (If you look too far at the end goal you may miss the journey). Regarding equipment, use a good (but basic) bike, but not the top of the range (you won't find spares for most fancy things). Even as far as cooking stoves go, you won't find the small camping gas canisters in most places, so use a stove which can burn gasoline (petrol), the fuel is widely available and cheap. Remember, eventually everything wears out and needs replacing (clothes, moving parts on the bike, camping equipment, and so forth). Do you think your trip has changed you as a person, and if so, how? Yes, it has probably humbled me (of course, I have to be careful about being so humble that I'm proud of it). I now live a vagrant lifestyle, and in countries like the USA and Canada many of the homeless people I meet have better bikes and camping equipment than what I have. This trip has also taught me to rely on myself for survival, not only in isolated wilderness areas, but also instances of arriving in big unfamiliar cities at dusk in poor weather, with nowhere to stay – I've learnt how to make a plan (and if it doesn't work out, I can mostly deal with that – but I'm not Superman). People often ask me what I've learned from this experience, and so far I have to answer that I've had to discard some of the things “I thought I knew” (per-conceptions, perhaps some of it suggested by the public mass media). Finally, how can people help with your goal of continuing to cycle around the world for as long as possible? (Of course, if anybody out there works for the visa department of an EU country, right now you may be able to help). Jokes aside, money is my main issue (I permanently scrape the bottom of the barrel). My South African bank details are:- Nedbank, account number 1230098097 (branch code 123009). If you are not in SA, then please contact me on e-mail ernestmarkwood@yahoo.com and I will inform you on how to donate, if you so wish. 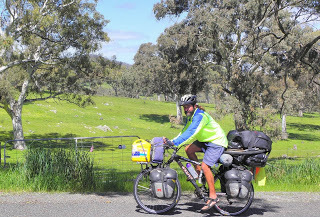 For more Meet the Cyclist interviews, check out the latest here – Bike touring blogs.